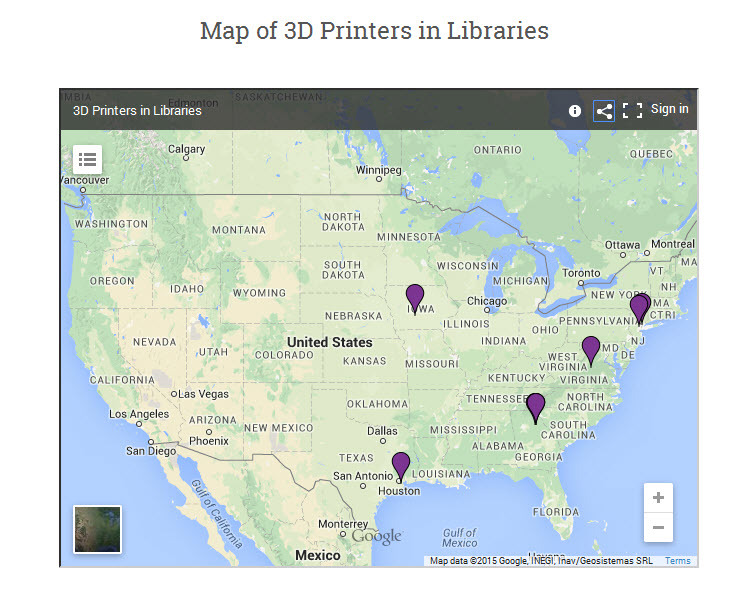 Amanda Goodman is creating a Google Map of libraries with 3D printers. So far there are a lot of missing pins so, if you’ve got a 3D printer in your library, head on over to the Map, and add your pin. Note: I’ve embedded the live map above, so if by the time you read this there is a pin or two in Nebraska, that explains why I said there wasn’t. East Palo Alto LIbrary has a 3D printer. How do I add a pin to the map? I love this site. I volunteer at the Brookfield Public Library in IL. I’ll add a pin. We just got a new Type A printer and a Monoprice Mini Select. after an old Makerbot went kaput. We have a 3D Printing club that meets the first Wednesday of every month at 6:30 PM. All ages are welcome, kids with an adult. The library accepts .stl files from patrons by email for printing, contact them for details.